“Unity in Diversity” sounds like a bad cliché – one of the many clichés plaguing the Eurocratic lingo – especially during formal speeches and events. Yet, the Dutch Embassy in Sofia has initiated – and almost completed – a project that does put some teeth into this motto by creating visible landmarks all around the Bulgarian capital. What is more, it has actually contributed a great deal to making Sofia unique within the EU. The Wall-to-Wall Poetry project was launched by the Dutch Embassy in 2004, when the Netherlands held the rotating Presidency of the European Union, in cooperation with the Sofia Municipality. It quickly caught ground and became a joint project of the Embassies of all EU member states and recognized candidate countries (EU 27 + Turkey). The Wall-to-Wall poetry idea is as simple as it is ingenious: decorating walls of public buildings around Sofia with poems by authors from the respective nationalities in their native language. The translation of the poem in Bulgarian and in English are also available on the spot. 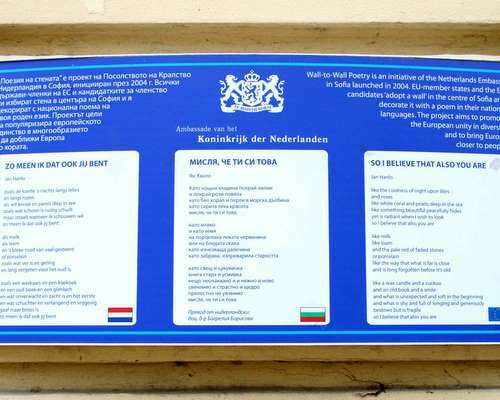 According to the Dutch Embassy, the idea originated from the Dutch city of Leiden where on the city walls there are poems from different countries. Yet, the crucial thing to note here is that thanks to the Dutch initiative, Sofia is the first EU capital with walls with poems from EU member states. The project is almost entirely completed, as some six years later the only EU+ states still unveil their poetry walls in Sofia are Malta, Romania, and Turkey. The Wall-to-Wall poetry project started, of course, with the opening of a Dutch Wall – located on the back side of the Bulgarian National Natural History Museum in the very downtown of Sofia. It features of poem by Dutch poet Jan Hanlo (1912-1969), a famous Dutch poet, who is also known for his attraction to young boys. Why did the Dutch government picked Jan Hanlo and this particular poem for its Wall in Sofia? According to former Dutch Ambassador, Willem van Ee, as cited by journalist Dirk van Harten, the purpose of the Wall-to-Wall Poetry project was to show not just the differences but also the common European values to which Bulgaria “also has to live up to.” He said the poem by Jan Hanlo could be seen as a homage to purity and transparency. Each of the Embassies of the EU+ nations could choose the building whose wall to decorate with its poetry. Thus, France selected the facade of Little City Theatre "Off the Channel” for the verses of poet Paul Eluard, Germany – the National Stadium “Vasil Levski” - for a poem by Friedrich Schiller, Italy – the building of the BTC – for verses by Dante Alighieri; the verses of Irish poet Mairtin O’Direain are on a wall of the Mall of Sofia; poem by prominent Portuguese poet Alvaro de Campos Fernando Pesoa decorates a wall of the Sofia Municipality; a poem by Scottish poet Liz Lochhead can be found in the Sofia subway, an idea, borrowed by the seventeen-year old tradition of London "Poems on the Underground"; a Luxembourg poem was unveiled at the sidewall of Sofia City Art Gallery. A number of EU countries have chosen to have their poems decorated on walls of school building. Thus, the Spanish wall is on the Miguel de Cervantes Spanish Language School; verses by the outstanding poet and patriot Sandor Petofi of Hungary, the Polish Nobel laureate Czeslaw Milosz, and Greek poet Kostantinos P. Kavafis can also be found on walls of high school buildings. The Bulgarian Wall in Sofia is on the sidewall of the Hristo Botev High School; it features part of the Hadzhi Dimitar poem by Bulgarian freedom fighter and poet Hristo Botev. How much a difference does the Wall-to-Wall Poetry project has made for the Bulgarian capital? The average Bulgarian adult or a school kid probably hurl past the poetry-decorated walls without even thinking about them.